The Kansas City Disc Golf community holds weekly leagues at courses all over the city, every night of the week. Divisions available for women and men. See the full league schedule here. Want to learn the sport and play with other women in a casual, beginner friendly format? Join Us for Ladies Night Out!  A free weekly disc golf league that is women focused and designed to be welcoming to new players to the sport. Bring out a friend and introduce her to disc golf or learn together! 2019 Season begins Monday April 1st. For the month of April we will meet at 5:30pm due to having less daylight. Questions- call or text Rhonda Crosby, 785-424-3672. Every Monday night April – September. Rosedale Disc Golf Course. 4125 Mission Road, Kansas City, KS. We’ll be using the Up Top course most weeks. It’s FREE every week and pre-registration is not required. Just show up a few minutes before our tee off time. We play a basic singles format most weeks but mix it up with random draw doubles or another format occasionally. Prizes each week. Check our calendar for additional clinics and special guests throughout the season. Do I need to bring or buy discs? We have discs available each week for you to use if you don’t have discs yet. Eventually you will want to buy a few of your own. We’d be happy to help you with recommendations on disc choices and where to buy when you are ready. I've only played a couple of times and I really like it but I'm not sure I'm ready for a league. We’re beginner friendly and have ladies every week of all skill levels. Some just started playing and go to ladies night to learn more about the basics and core skills. Other ladies are more advanced and help mentor the beginner ladies. My schedule varies and I'm not sure I would be able to make it every Monday night. There’s no commitment. We know how challenging it is to balance all our responsibilities as women, wives and mothers. Show up and play whenever and as often as you can. Whatever makes you happy! The main thing is to be comfortable. We suggest athletic or hiking type shoes. 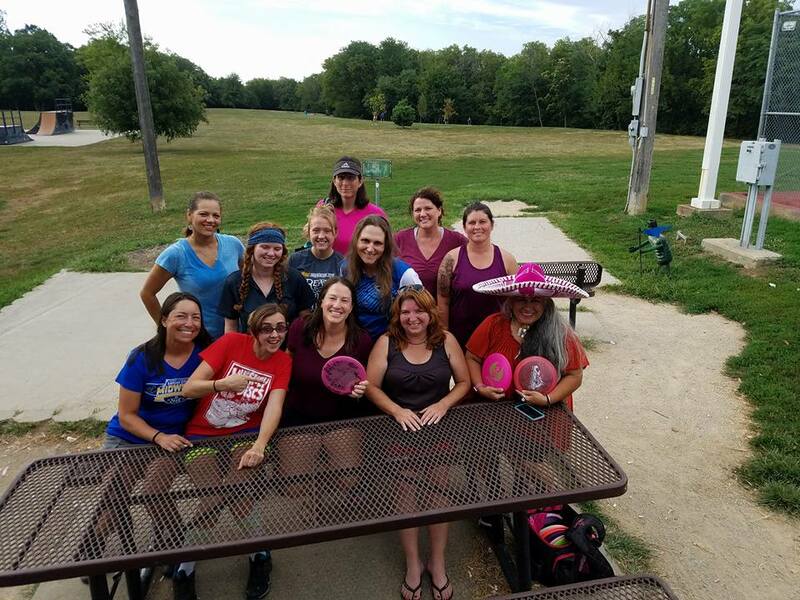 Attire for disc golfers varies based on season but for women typically includes leggings, shorts, golf skirts, sport performance type shirts, hoodies, tee shirts, and tank tops. We also love our crazy socks! I'm a more advanced player. Is this league only for beginners? No way! We have several advanced and pro players too that come out and play just to have fun and camaraderie with the other women. You can come out and help mentor and support the beginners or choose to play for Diva Bag tags with other advanced players that want a little side competition. 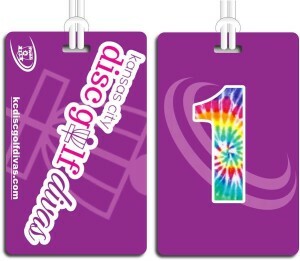 KC Divas Bag Tags. Available for $6.00. Absolutely! They are our little future disc golfers! Many women bring their children out, strollers and all. If there are enough on a particular week, we try to put them all together on one card as a family group. One of the KC Disc Golf Divas, Ava Meyer. 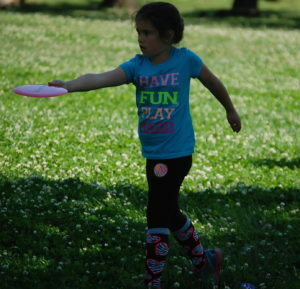 She’s just 8 years old and already has a love and passion for disc golf! Yes- We are pet friendly! 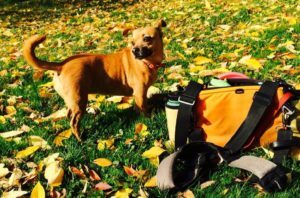 Just be sure to bring poo bags and be respectful as you are in any other public park. Meet Pico. 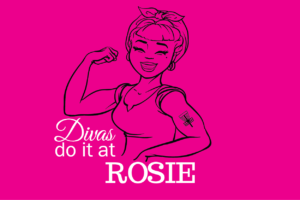 She’s a regular with the KC Divas!